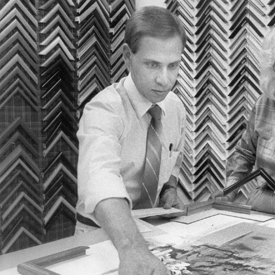 I started framing over 35 years ago as a part-time job in college, and fell in love with the process immediately. I was fortunate to apprentice with some true craftsmen, and learned the trade using many of the old techniques and processes that now seem out-dated but sometimes can prove to be essential. The in-depth knowledge that these skills required continue to support and enhance the hi-tech processes that have been integrated into our production.